Update: Nature Find is still a great tool to find national, state, city parks and other sites to connect with nature. This past Sunday I decided to go hiking with a friend. It was a gorgeous day and we decided to go to a favorite local spot, Great Falls. As we drove up to the entrance, it hit us. It’s Great Falls National Park, and it’s closed because of the government shutdown. We were already in Great Falls and needed a new place to hike. That’s where the National Wildlife Federation’s Nature Find tool saved the day. We found Riverbend Regional Park just down the road, and it was fantastic! I thought it would be useful to take a few popular national parks and find nearby alternatives while the parks are closed. Prescott, AZ has several nature sites worth checking out, especially Willow Lake. The natural beauty is undeniable (just look at the photo below) and the park is an important birding area designated by the National Audubon Society. This thing is ancient. I mean, over 1 million years old, and one of the oldest lakes in North America. Mono Lake has incredible limestone towers (called tufas) that form by the interaction of freshwater springs and alkaline lake water. Also, it’s also a sensitive habitat for 1-2 million birds each year. South Dakota’s Custer State Park has over 73,000 acres full of wildlife, including bighorn sheep, prairie dogs and pronghorn antelope. 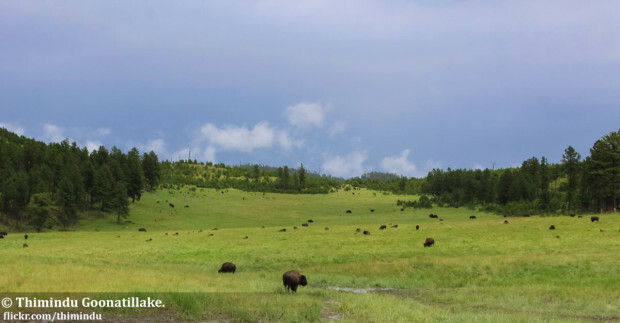 The park’s herd of 1,300 free-roaming bison is one of the largest publicly-owned herds in the world! Yes, there are beaches in Indiana. Amazing beaches. The sand dunes at Indiana Dunes State Park (formed over thousands of years) tower nearly 200 feet above Lake Michigan. The area is ecologically diverse offering the chance to explore bogs, fens, prairies and woodlands! This park is filled with streams, waterfalls and mountain views. It’s one of the least disturbed forests in the Cumberland Mountains. View brilliant fall colors and some of the best wildflowers in Tennessee. I’m an Oregonian and couldn’t resist including one of my favorite state parks. Silver Falls has an abundance of Douglas firs, hemlocks and cedars and the forest floor is covered with ferns, moss and wildflowers. There are 10 waterfalls to choose from, or see them all! The site has a wonderful view of the Katahdin Range, and presents the vibrant and iconic fall colors of Maine. Wildlife is abundant and includes black bears, moose, bobcats and red foxes. Throughout Baxter State Park, several secluded waterfalls, streams and ponds can be found, explored and enjoyed! Perfect, so do I. Let’s be honest, there really aren’t “alternatives” to our National Parks. Your voice is critical in telling Congress that they need to pass a funding bill so that our National Parks can return to service! Don’t worry, NWF’s Nature Find database has over 12,000 nature sites across the country! You can find parks, trails, campsites and more near you. We can help each other by sharing favorite parks for viewing wildlife, getting outdoors and enjoying nature. Share yours in the comments below!